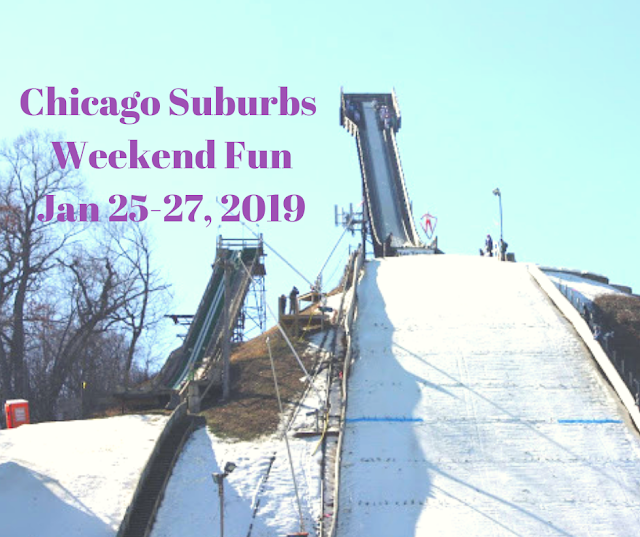 Just because it is winter, it doesn't mean we aren't having fun here in the Chicago suburbs! There are plenty of events this weekend. There are some outdoors ones, so I caution you to make sure they are still happening this weekend due to cold temperatures. As of this writing, they are. If you are thinking about a road trip, this week is Milwaukee Museum Week. January 26-April 7 Chagall for Children, Arlington Heights Memorial Library, 14 interactive exhibits encouraging you to insert yourself into Chagall's work, there are special sensory-friendly hours, the exhibit is free and great for kids ages 2-12, I will have more later this week! January 26 & 27 Norge Ski Jump in Fox River Grove A exhilarating ski jumping tournament and true and traditional Illinois experience! Event runs 12PM-4PM each day with gates opening at 11AM. Tickets are $15 at the door, $10 at select local merchants and $11 online. Kids 12 and under are free. Bring blankets and lawn chairs. We usually pack a lunch to eat in the lot, there are a few items for purchase including chili. January 26-27 Husky Heroes The Morton Arboretum. Husky sled dogs demonstrate sled-pulling and skijoring. You can check out equipment, meet sled dogs and learn about adopting huskies. There will also be a wildlife photo exhibit. Free with regular Arboretum admission. January 26-February 3 Winterfest in Lake Geneva The event's focus is the US Snow Sculpting Championship (January 30-February 2). Other events include the Human Dog Sled Race, Cocoa Crawl, Amazing Ice Castles, chili cook off and more. See schedule for details. Bald Eagle Watch Weekend at Starved Rock in Utica January 26-27. The event includes a variety of hikes, kids activities, talks and birds of prey shows. There are some advance ticket sales. Day of is free admission but first come first serve to shows without tickets. There is a trolley that can take you from place to place for $2 per person. January 26 Family Winter Scavenger Hunt and Campfire at Trailside in River Forest, 1PM-2:30PM, hunt for signs of animal and plant life in winter, warm up with s'mores and a campfire, $2 per person.